Sparks loft up from the bonfire held at Bockman Park after the Parade of Lights in Ronan. The Fisher family puts on the finishing touches of its "Pirates Christmas" float as dusk wanes prior to the Ronan Parade of Lights. Jack Collins, a.k.a. Santa Claus, sits patiently behind the wheel for the parade to begin while “O’Leary’s Old Ladies” prepare for their gala ride down Main Street. RONAN — The holiday season was on display in downtown Ronan Wednesday as members of the community put on a brief but brilliant display on Main Street. Floats lit up Main Street from St. Luke’s Hospital to Bockman Park as part of the Parade of Lights Wednesday evening. A trio of veterans served as honor guard and paraded the nation’s flag at the head of the procession. 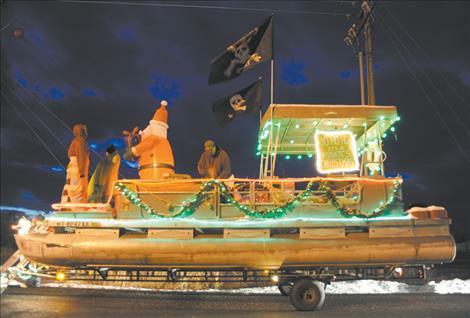 Close behind the honor guard was the Fisher Family float, which displayed a “Pirate’s Christmas” with a dressed up boat. O’Leary’s Old Ladies followed with Santa at the helm. The ladies were dressed festively as colorfully adorned Christmas presents. A family float of a children on hay bales followed, then a story time Christmas float presented by Community Bank displayed a living room and reading chair, complete with a fireplace. A dressed up four-wheeler with Christmas lights was followed by a horse-drawn hay wagon filled with children. Santa ended the procession waving to children from his seat in Ronan Power Product’s four-wheeler. 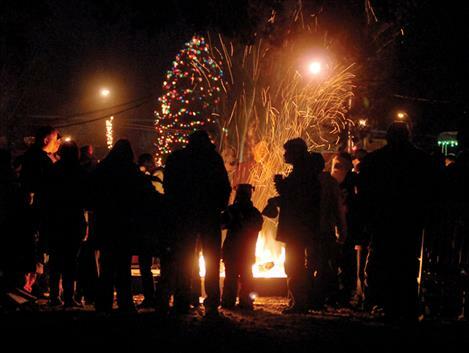 The evening culminated with a bonfire in Ronan’s Bockman Park, where parade-goers warmed themselves and enjoyed impromptu caroling.